Improper Course: Altered Foils - Are They Legal? A favorite saying that I learned from a friend of mine is, "Sunshine is the best disinfectant." Since our readership seems to be up and there is no shortage of opinions, perhaps now is a good time to shine a little sun on the subject of altered foils. Laser Class Rule 14(c) Surface refinishing of the centreboard is permitted provided the original shape, thickness and characteristics are not altered. The first time Doug heard about the subject of altered foils was a few years ago from a Masters sailor (sailor 1) who had them and named about a half a dozen sailors who also had them. Doug was told that many of the top level Masters sailors use them and 'if you want to win, you have to use them too.' Then sailor 1 explained that there was a loophole in the rules that allowed for alteration without specifically breaking the rules. And even though it's supposedly "legal" no one talks about it. There is a template for measuring in at the Worlds that is a rectangular slot with equal thickness and the centerboard has to fit in the slot. This controls the maximum thickness of the board but not the placement of the thickness (up, down, forward, back). Doug's theory is that the alteration is a movement of the thickness but he doesn't know for sure. The entire subject made Doug uncomfortable. First, because of the people named (at the very top) and second because it didn't sound legal and he didn't want to believe that he had to use them in order to be competitive. Doug never considered using them but would keep an eye out for signs that others were indeed using them. At the recent Masters Worlds, the subject came up again. This time another sailor (sailor 2) gave another list of specific names, some of which were in Doug's fleet and one of which, (sailor 3), Doug knew beyond a shadow of a doubt would never use them. But then sailor 2 went on to give specifics about what was done and how to tell them apart from regular blades. How they are fatter and some may be slightly weighted at the bottom to the point that they don't float like other foils, how they are more rounded here and bull-nosed there. He said those who have them don't have to hike as hard. This prompted Doug to talk to sailor 3 who would have been sailing right next to one of those that had been specifically named by both sailor 1 and sailor 2 and asked if he noticed anything when they were side by side. Sailor 3 said the other guy seemed to have a more relaxed style and didn't seem to be working as hard as he was in order to go the same speed. Sailor 3 hadn't heard about altered foils and he didn't seem to really care. He had noticed a consistency problem in manufacturing and some boards were generally thicker than others and when selecting stock foils, he advised choosing the thicker ones. Same thing with centerboard trucks, some where narrower which is also better. Having a little time on my hands at the Worlds, I went on a reconnaissance mission, covertly taking pictures of the foils of one of the sailors named that was in Doug's fleet. Later I zoomed in on the pictures. They looked like charter blades to me. Although that sailor was doing quite well, he wasn't on the podium and he seemed to be working just as hard as Doug. Then I skimmed through my photos and checked the tops of the centerboards of a few of those named that would have flown to the event and could tell who appeared to have brought their own blades and who was using charter blades. In the meantime, Doug chatted with two class officers on the topic. Both were surprised to hear of the issue and both named the US person most people used to finish foils but they hadn't heard about alterations of any sort. Both encouraged Doug to talk to the class measurer about changing the measuring process to eliminate any doubt about alternations. One of the officers did ask rhetorically why anyone would bring their own blades and risk damage when they were getting perfectly new ones with the charter. Good question. So far there is one admission of use, some casual mention of others' use, one potential observance of use, but mostly, just unsubstantiated claims. I suggested Doug order a set to see if they really do make a difference because there is simply no other way to know. He refuses to do so. I told him they could be for me since I already work harder than everyone else to stay on the course and I don't ever win anything on a Laser. He still refuses. What would you do with this information? a) Nothing, it's irrelevant; b) investigate it quietly; c) investigate it loudly; d) order a set and join the crowd; e) sail your own race and forget about it; or f) other? Doug tried a and b and has opted for e.
There is no loophole in the rules for anything like that. Everything you mention is changing either the shape or the characteristics of the foil and is clearly not allowed. And if there's any lingering doubt after reading rule 14, the fundamental rule removes it. If anyone is caught using a foil that has been intentionally modified to improve its performance they should be tarred and feathered and run out of town. Or maybe made to finish the regatta in a 4.7, with CHEAT written in big letters across their sail. You can legally reduce the thickness of the trailing edge - this can stop the humming and can arguably have a small impact on performance. I have done this in the past, but don't bother now. You can refinish the surface as long as you're not making it better than its original finish (my words). This allows you to restore a used blade, but that's it. I definitely do this before any important regatta because a scratched blade can have a big impact. There will always be some looking to twist the rules for additional advantage, but in my travels in the laser class I haven't really seen any evidence of it. 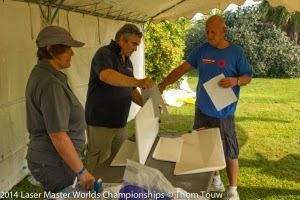 I've sailed at the pointy end of masters worlds fleets and have always been impressed with the camaraderie and friendly spirit, along with the intense competition. I have a few friends who've won masters worlds (not me sadly) and I know absolutely that they sailed with stock gear. Maybe I'm naive, but I don't think there's a problem with this and life's too short to go looking for a problem that might not exist. So after all that, I vote for e.
Abe got it in one.....life's too short. The cream rose to the top in Hyeres because they consistently sailed well, forget the foils, heavy clothing, coaches, psychology etc.............the winners sailed well, enjoyed themselves and won. Thats why they were there. Anyone who saw Brett demolish a great Masters fleet could only admire the skill, not speculate on anything but supreme skill. I feel sorry for any people who need to win so much that they would ignore the most basic principles of our sport as stated in our class rules and the Racing Rules of Sailing. Anyone who does win by cheating knows what they did and I can only hope that their satisfaction in their "achievement" is tinged by that knowledge. They must also know that their fellow sailors see what they are doing and that they lose all our respect by not playing the game fairly. Such people are just like Lance Armstrong and Alex Rodriguez in other sports. They often have great innate talents and also work hard at the sport. But they also feel the need to cheat to boost their results. What sad and pathetic people they really are. But in the end life is too short for me to spend my time trying to investigate and expose the cheaters so I opt for e.
So there's a rumor that foils are being altered. If there's smoke there could be fire. So let's all stick our collective heads in the sand. About the only other thing that could be done is the suggestion from the class officer in Pam's post: have the class measurer devise a better measurement process that would detect any illegal alterations (if they exist.) He would probably have to have samples of suspect foils to be able to do this. Or I suppose some clever volunteer with the necessary technical skills could acquire some of these suspect foils and do some experiments to see if he or she could devise a measurement process to detect them, and then recommend that process to the measurer. I wanted to get some and try them. Maybe they are just nicely finished and don't really provide an advantage. Maybe they just allow the person not to have to work as hard but don't really go faster and are only an advantage to those who are unfit. But, the people named are extremely well respected and are excellent sailors regardless of foils. I'm just hoping if they are using them that they will self police and decide not to use them at significant events. And maybe the person doing the work will decide it's not worth it to continue. It's a very subtle issue isn't it? If you just close your ears to all the chatter and think "I just want that nice man to refinish my foils so they are all nice and shiny" then maybe you can convince yourself you are not really gaining any kind of illegal advantage - whether it is sailing faster or not having to work as hard. But sailor 2 knows (or thinks he knows) that they have been altered to change shape and maybe other characteristics in violation of the rule. And everybody reading this blog post knows that sailor 2 knows that. And I really don't think these folks are going to "self-police" and not use these foils at major events. I suspect they save these foils for major events. Lance Armstrong was extremely well respected too. Until he got busted. When I bought my boat used..the d board had a two inch piece missing from the bottom corner and was twisted. I handed it to a local shop who fixed it and read gel coated it as well as reinforced the trailing edge. They tend to be fragile. The boards never hummed but also did not sink. In fact it kept floating up in the trunk. Speed difference? Don't know. But they looked damn pretty and mentally that worked for me. Tiller man can you share my after photo of the board from buzzards bay? Pam, you are posting interesting arguments to our attention! I would like to describe two different approaches that seem very distance one from the other but at the end may rise some uncertainties. First approach: following rule14.c we are not permitted to alter the shape, thickness, etc. of the centerboard. This is a very clear statement. We all know that during boat fabrication all centerboards does not come out exactly the same. I imagine that there is a quality control that avoid centerboards outside limit to be put on the market. But the ones within the decided limit are sold. It is hence possible that we buy a centerboard that has a shape which is different from the theoretical one and is (if we are lucky!) faster: let’s call it ‘faster centerboard’. Considering rule 14.c, on the contrary, we are not admitted to re-create the same shape of ‘faster centerboard’ even if it is within the required class rules tolerances because we are doing it expressly to gain an advantage. What about choosing your equipment when you buy a new laser. I admit that when I bought my first and new laser 1.5 years ago (I am new in this class….) I was suggested by a friend to look for a certain rake and to select a lighter bottom mast. Is this legal? I did it because I was told it can give me an advantage considering my poor weight…Did I cheat? I hope not. If we buy an original material from the supplier which can give us some advantage (or we think so…) we are not cheating if we expressly act on our material to better the performance staying within the class limits we are cheating. Again, what about if we shall really repair a centerboard which was really damaged. It is not enough to tell the shipyard to re-create a shape which is within the class tolerances? Normally an Engineering approach is to exactly define an admitted shape and tolerances. On the contrary it seems that here the difference from cheating or not is if we think to make something expressly to gain an advantage, regardless of the actual material that we are using (if it sold by LaserPerformance it is ok in any case). Last point: to check the shape of a centerboard is relatively easy, by creating some templates reproducing the shape (with tolerances) at , say, 3 different sections: these template could even be made of strong paper and could be easily inserted on the centerboard. Has someone idea of where to find the theoretical shape of a Laser centerboard to generate these template? Do not worry: I keep my original centerboard like it is, but I am now curious to see how close it is from the theoretical shape! There is an easier solution to your problem, at national events the official Laser foil molds come out. If it slides in it is legit, altered I guess you have a real problem. Think of it as TSA for sailing. Three large regattas and the "special" equipment dries up. There's a clearly defined process in your class rules for dealing with measurement problems: Part two Rule 2, So a measurer is allowed to check a selection of boards any way they like, and some templates seems the obvious option. Similarly we all have a duty in the fundamental rule to help enforce rules by protesting if necessary. The stuff about hiking less sounds extremely unlikely. Hard to think of a way a better board profile can do anything other than decrease drag. A possible reason for someone bringing his own board to the Worlds would be to prevent damaging the board that comes with the charter (and being forced to pay for the damage). When I travelled to the USA from Australia for the SF master world's, I bought a set of "off the shelf" foils to take home. Why? They are better quality than the rubbish served up at home. Straighter, better finished. I don't consider this cheating...I'm not getting an advantage I'm just getting a product fit for purpose. I've had domestic foils delaminate, split in half, bubbles appear on leading and trailing edge etc etc. Not everyone who has different foils is a cheat. I'm surprised by that comment. Doug is of the opinion that the Aussie boat quality is superior to US quality. So much so that his last boat was imported from Oz. A fellow at the Halifax Worlds asked if he could measure it and and took about 15 minutes measuring every possible thing and said it was perfect and offered to buy it on the spot and take it back to France. That was the hull but Doug did noticed a slight manufacturing flaw with the rudder but they replaced it with no questions asked. That was about six years ago. Doug does say that the first 3000 Lasers made in Oz (back in the 70s) were extremely bad. Is your opinion of the quality based or historic or recent purchases? I have had poor experiences with foils over past 4 years. One set the "paint" peeled. They were replaced. Another set had bubbles in leading and trailing edges. Finally a rudder split in half (started at the hold down rope). There's no question the local made hulls have a good reputation, but I believe the foils are imported from various factories of questionable quality. While I also have experienced the benefits of "no questions asked replacement", it's a hassle. My USA foils were also made in China, but from a different factory (I still have the Chinese box!). Same price as australian foils. Much better quality. If I'm traveling to a worlds I'll probably take them along because I know they are good. Very little inconvenience to have the peace of mind. So While there may be some truth to the rumours of doctored foils (or is there; has anyone actually been caught out? ), it's wrong to assume everyone who brings their own foils along is trying to cheat. I'm doing it to relax. Good information to know about the different quality. Thank you! I agree that there are certainly valid reasons for bringing your own foils to a Worlds so nothing can be assumed. There is quite a good reason for wanting to take your own foils to a Worlds. At Hyeres, there was a problem with rudder blades not fitting the template. They were too fat, so sailors were told to "fix it and come back". There were so many that didn't measure and the charter supplier was in a bit of a state over the issue. Unluckily, mine also had the problem. They were from the stock of their brand new foils, and as I understood it, all the foils that had seen use for one regatta were OK. My rudder was a hair too thick, about the thickness of one coat of paint on each side. It was plain to see that for me, I just needed to take a bit of wet n dry paper to it to make it legal. While the charter rules forbid any kind of refinishing, I obtained permission from the supplier to do it. If he did not, he would have had to fix it or supply me with another. The sheer volume of the problem however saw sense prevail so I was allowed to do the work myself. I was able to do a pretty good job and the next day when I presented the blade to the measurer, I was able to get it passed. But having been through the stress of it, I might well consider taking my own foils next time. Thanks for your update. I really don't understand why there is still a QA problem.